Sew Sassy is not your traditional quilt shop. Bright colors and unique designs as well as traditional patterns can be found displayed on it’s walls. You will also find a large collection of batiks, fabric collections by Laurel Burch and others as well as many traditional fabrics. 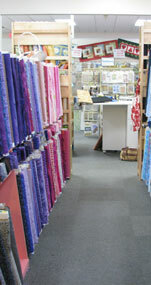 Our teachers offer a range of quilting classes form beginner to advanced quilting as well as beginning sewing.